It seems like the most interesting start-ups in the past twenty years began in a garage. Of course, many of these garage start-ups were in finance, electronics, or new technology; a hazelnut start-up had never been seen before the Masante brothers came along. But when Claudio and Diego began their adventure, it started in a 15th century garage in Cascina Masueria in Murazzano, in the heart of the Alta Langa at 730 m of altitude, in the land of Dolcetto wine and hazelnuts. The family business was founded in 1939 by Enrico and Rosa, the brothers’ grandparents and purchasers of the historical Cascina Masueria. In 2000, they placed the future of their business entirely in hazelnuts. Francesco and Margherita, parents of Diego and Claudio, uprooted all the Dolcetto vineyards; the new wine regulations were detrimental to the higher altitude hills in Alta Langa, where the grapes are often unable to reach the required sugar content for production. With typical Piedmontese resolution, once they decided what they would do, they said goodbye Dolcetto and hello to the prized Piedmontese variety of hazelnut called the Tonda Gentile Trilobata. My father left me land like this, and I want to do the same for you—leave you clean land. That is, free of chemicals and pesticides. Even if yields are lower, it is the only way to have a healthy, natural product. Thus is was a shame that these healthy, delicious, beautiful hazelnuts were being sold to wholesalers. Over the years, Claudio, class of 1988 and Diego, class of 1990, began to voice their thoughts: to valorize our hazelnuts, we need to work with them directly at home. In 2014, the two brothers were ready. Diego, the younger brother, is an agrarian consultant and he and his father follow the entire cultivation process. Claudio has worked in a bakery since he was 18, and has always been obsessed with processing hazelnuts. They converted an old garage adjacent to the farmhouse into a production laboratory, and in September 2015 they began production. 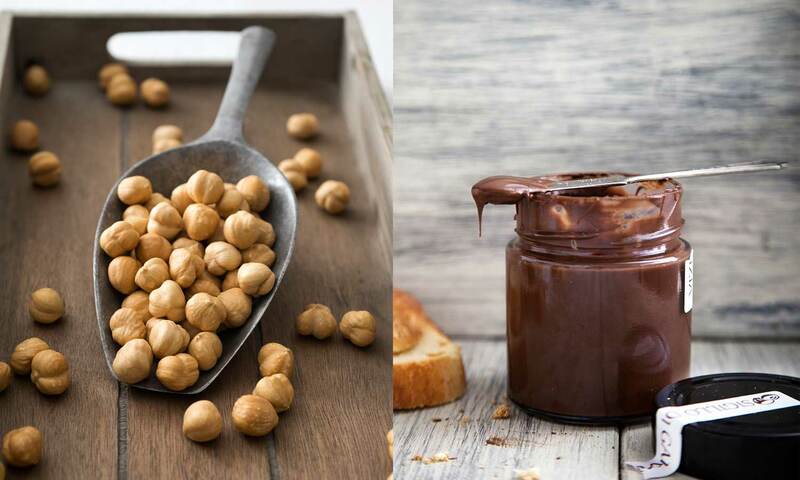 They shell and toast the hazelnuts to produce hazelnut flour and gianduja cream, that chocolate-hazelnut mix that Piedmont is famous for. The gianduja cream created by this two-brother garage band seems to have a hypnotic, addictive effect, just like your grandparents were afraid rock ‘n’ roll would do: anyone who tastes it wants more, and more, and more. The “secret” (which, says Claudio, isn’t exactly top secret) is in its simplicity. They start with a good product that, rather than being the leftovers of production, has been selected with love, nut per nut. The flavor of hazelnuts must be exalted, not covered. The cream of gianduja by Cascina Masueria is one of the few in the world that uses only three ingredients: hazelnuts, cacao, and cane sugar. And like all truly innovative products, for the moment it is still rather exclusive. It is sold only in the Langhe, and we foodies at Originàrio have happily discovered it for you. They’re looking forward to the future for two reasons: their father Francesco has begun the process of obtaining organic certification, while Claudio and Diego have begun studying the effects of extracting hazelnut oil in their garage. They predict sensual salads and amazing macedonia (mixed fruit cups). Stay tuned.